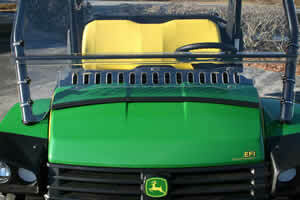 John Deere Gator HPX and XUV Custom Windshield is handcrafted with professional grade 1/4″ Lexan to provide maximum durability and visibility. 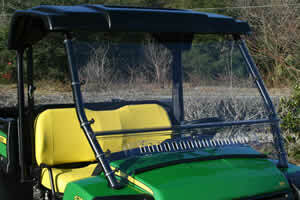 John Deere Gator HPX and XUV Custom Windshield is handcrafted with professional grade 1/4″ Lexan to provide maximum durability and visibility. 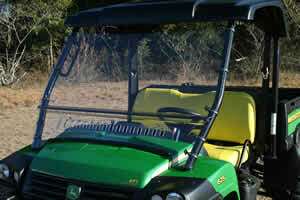 Exclusive Aero-Vent sliding ventilation system allows users to adjust the amount of airflow for for maximum comfort. A custom fit is ensured with stainless steel hardware. Easy to Follow Step by Step Installation and care instructions are included. Custom made to order in the U.S.A. 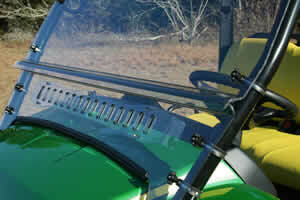 This is not your typical windshield you see on line, but a fully vented professional grade windshield.